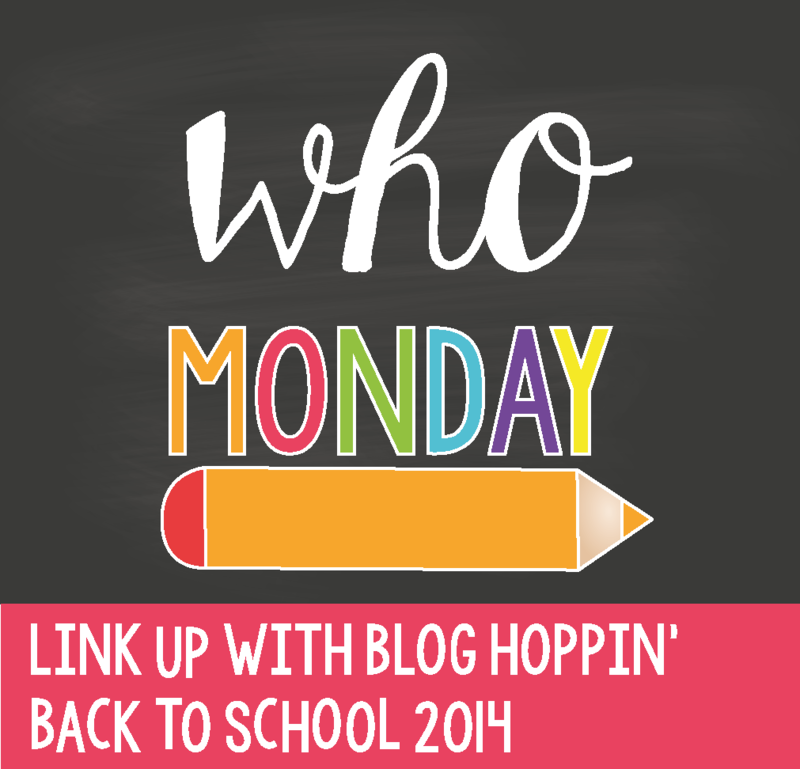 I am linking up with Blog Hoppin this week for their Teacher Week Linky. It's my first week back with kids and my birthday week but I'm really going to try to link up every day! Can you say busy?? Today's post is supposed to tell you all about myself. I feel like I just did that when I linked up with Stephanie for Meet the Teacher last week. So, you might want to hop over to this post and read all about me and see tons of pictures. Today I'm going to think about it through the eyes of a teacher and take you through my day. I'm an alarm clock hater. 5:20am is way too early for this night owl. Alarm clocks are totally the worst part of my job. I'm an energy bar girl. It's breakfast every single morning. Grab and go - that's my style! I'm a reader. If I could, I would read aloud to my students ALL DAY LONG. I love a good book. And, I love sharing that love with my students. I'm a picky eater and a creature of habit. I don't really eat meat or veggies. I'm a total carbetarian. This makes school lunches difficult. Last year I took a coco-loco chobani yogurt for lunch every single day. My fridge is already stocked for this year. I'm an early leaver. Yep. I wasn't always, but I leave as soon as possible. I pack it up and take it home. I would much rather work in my lounge clothes in my comfy spot than at school. I'm a dog lover. Plus, I want to get home and see my Boxer babies as soon as possible. I'm a gym member. I couldn't put gym rat or anything there. Let's face it, I don't love working out, but I do. Usually every day after school. Thankful to have my mom to go with me and keep me accountable. I'm NOT a cook. Ever. Seriously. I've been married 15 years and I've cooked once. It's not for me. My husband cooks, but not often since he works late, so we eat out nightly. Hence, why I'm a gym member. I'm a reality TV-lover. Right now I'm all about Big Brother. I'm hoping Nicole comes back in the house...I also like Donnie and Frankie. My TV is almost always on Bravo though. I've never missed an episode of any Real Housewives series. I guess I love to watch a train wreck....or something that can be mindlessly playing in the background as we grade papers, laminate centers, or write lesson plans. I'm a night owl. I rarely want to go to bed before midnight and that makes that 5:20 alarm clock my nemesis. I'm a teacher. I'm sure if you went through your day it would look much like mine. We get up early, take a lot home and work late. It's tiring. But, we wouldn't change a thing because it's worth every minute. Go link up and let us know WHO you are! OMG! I #ilovequiettime, too! I can't believe that you have no break during the day! I've heard that before, but doesn't that violate some labor law? Our union dictates that we have a 30 minute duty free lunch every day. Luckily, you've learned how to adapt! Now, that I have kids at home, I try to leave as early as possible, too. Home is so much more convenient with all the technology we have available to us now. I LOVE Big Brother, too! I think Derrick is playing a great game! I really like a lot of them this year. Donny seems like such a kind soul. Frankie cracks me up and Zach is really growing on me. Since Amber left, Caleb has been more focused on the game. I don't care too much for Christine, Cody, or Victoria. Ugh! Alarm clocks are totally the worst!!! I have to set mine to go off like 5 times so I will actually get up. I too used to stay later in the classroom to work on things but now I try my best to leave as soon as the kiddos are out the door. How terrible you don't have a break! I love that you eat out every night - I hate to cook. Thankfully we have Munchery here and they deliver gourmet meals to our house! Ha! So great to learn a bit more about you, Amanda!